Are You At Risk for Cavities? Are you at risk for cavities? That may sound like a trick question—everyone is at risk for cavities! But some people are at a higher risk than others, and knowing the risk factors could help you improve your oral health and avoid the extensive tooth decay that eventually turns in to the dreaded cavities. So, in the spirit of helping you avoid future cavities by educating you on some of the many risk factors, here’s a list! Already having cavities: This may sound silly, but if you’ve already had cavities, you’re more likely to have cavities in the future. Eating lots of sugary or acidic foods: Cavities are caused when sugar meets the bacteria in your mouth and turns into acid. Acid erodes tooth enamel, so highly acidic foods also weaken teeth. Poor oral hygiene: Just like sugar is one part of the process that leads to acid production, bacteria is the other part. Not brushing and flossing properly will let bacteria multiply, allowing cavities to form. Lack of fluoride: Fluoride strengthens tooth enamel, making them more resilient and cavity-resistant. Badly done fillings and crowns: When a filling or crown is not done properly, it can provide crevices in which cavity-causing bacteria can hide and escape toothbrushing. Family history: Whether it’s because good oral health habits weren’t taught at home or genetics that make teeth more susceptible to decay, a family history of cavities increases your risk. Dry mouth: Saliva actually helps flush bacteria from your mouth, so dry mouth can increase cavity risk. Eating disorders: Poor nutrition weakens teeth, leaving them open to decay. Also, if your eating disorder involves self-induced vomiting, the increased acid wears down tooth enamel. Not visiting the dentist regularly: Even if you practice excellent oral health care at home, you need regular dental hygiene visits and dental exams to keep cavities at bay. 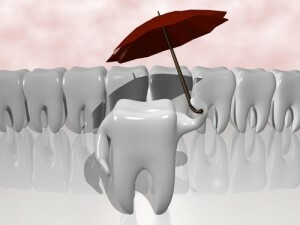 It is recommended that you visit the dentist every six months for optimum cavity protection. Special needs: If you care for a family member who has a disability, make sure you’re thinking about their oral health care. This often gets overlooked and can cause them to get cavities. It may seem like there’s no way to win against tooth decay and cavities, but many of your risks can be lowered by making certain choices. Cutting back on sugary foods, using tooth care products that contain fluoride, and regularly visiting your dentist are some simple steps that make a big difference. Don’t let yourself get caught with cavities! Assess your risk, and lower it. Next Next post: For This Year’s Halloween, Choose Candy Made with Xylitol!